- Simplifies twisted pair termination by allowing the wires to inserted through connector and out the front. - Technicians can easily verify proper wiring order by easily viewing color coding. - RoHS, UL and FCC Compliant and are certified for use in all Category 6 Data Networks. - OPTIMIZED FOR HIGH PERFORMANCE. - Reduces distance between the wire twists and contacts resulting in improved performance. - Productivity - Cable termination is optimized by pulling the connector down over the cable jacket and seating tightly in the rear of the connector. - Our RJ45 Pass-thourgh Ethernet Connectors let you quickly and easily create Category 6 Ethernet cables with your desired lengths. - See through design makes wire sequence verification a breeze, speeding up terminations and reducing scrap & waste. - Reliable High Speed Data Transfer guaranteed with our Gold Plated 3 micron 3µ 8P8C 3 Prong Pins. - They work with virtually every model of RJ45 crimper tool and 24AWG Cable. Platinum Connect RJ45 Passthrough Ethernet Connectors are RoHS, UL and FCC compliant and are certified for use in all category 6 Data Networks. We stand by our premium RJ45 Passthrough Ethernet Connectors. We confidently offer a 90 Day Money Back Guarantee for your peace of mind. 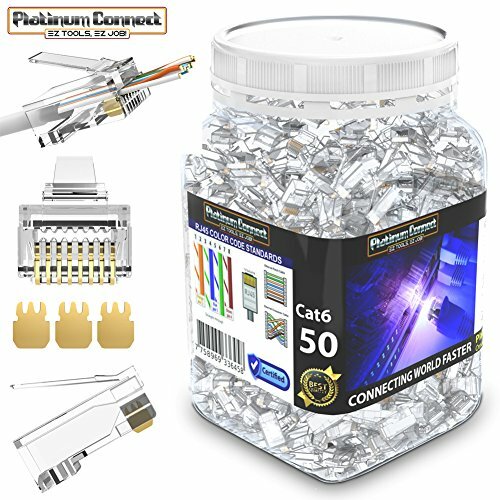 Don't leave your data connections to chance, add OrbTech 50 Piece CAT6 RJ45 Passthrough Ethernet Connectors to your cart today.